Not related to the road trip but I am currently connected into a Comcast configured Wi-Fi access point and just noticed that I have a native IPv6 connection and almost all of my connections are over IPv6. The only IPv4 connections are Blogsy and Clustrmaps.com. Pretty shocking considering the number of tech journalists that seem to ask why bother with IPv6 since no one is using it. 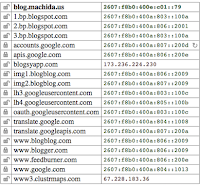 The image is a screen capture of the connections established by Chrome to display my blog page. And, it's not just Comcast. 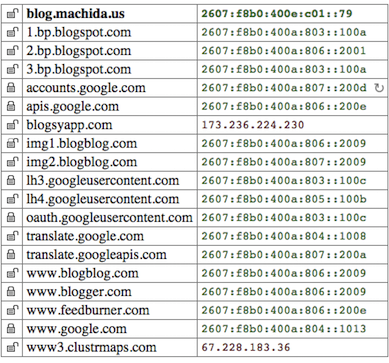 These are the IPv6 addresses assigned to my iPad by Verizon on the LTE cellular data network. No IPv6 on the AT&T LTE cellular data network (iPhone) though it also has an address from the Comcast Wi-Fi access point. Does this post suggest that I'm getting bored? Nah not bored! Well maybe a little. i think you are needing to be on the road again! Ha, I understood none of that. I am not very tech savvy. Part of the problem is that even those that believe themselves to be "tech savvy" don't understand. And many, mostly in the U.S., don't understand the need. I need to get off my soap box. Yeah, I'm with you on that Brandy. Whatever you say Richard. How are the repairs going? Still plugging away I guess. When I called this afternoon they are waffling on whether they would be finished late Thursday or not.